The Trump Administration has reportedly started moving ahead with its plan to relocate the U.S. embassy in Israel from Tel Aviv to Jerusalem. Below is an examination of what is known so far about these plans. A map showing the location of the site for the planned embassy and the surrounding area can be viewed/downloaded here. Where will the new embassy be located? According to the best available sources, the current plan is to locate the new embassy at the site of the Diplomat Hotel, the rights to which were purchased in 2014 by the United States and located in the Arnona neighborhood, adjacent to the American Consulate’s Consular Services building, built there several years ago. The lease for use of the property, which is currently functioning as an elder-care facility for immigrants from the former Soviet Union, is due to end in two years, and notice has already been given that it will not be renewed. There have been numerous reports according to which the Trump Administration plans to adapt and upgrade the existing building to U.S. standards and needs, rather than constructing a new embassy building at the site. This process is expected to take at least three years. As a temporary measure, the Embassy could be housed in the Consular Services building, with the building being retrofitted for this purpose. If the Trump administration genuinely wants to move swiftly (and there have been reports to this effect), something like this will likely take place. The State Department spokesperson stated that the Trump Administration's Fiscal Year 2019 budget has prioritized funding for a U.S. embassy in Jerusalem “once design and construction plans are finalized.” It is not clear to what extent the State Department will be in a position to advance the implementation of these plans before the lease of the Diplomat Hotel ended. Are reports claiming the embassy site was confiscated from Palestinians correct? These claim had a good deal of merit in the past (with respect to a different site); in relation to the site currently in question, this is not the case. In the 1980s, the U.S. acquired from the Israeli government a plot of land located on the Hebron Road, and loosely designated it for a future Embassy. The land in question had served as the site of the officers' quarters of the British Mandate's Allenby Compound. Fate would have it that this piece of land had been expropriated by the British Mandate for that purpose from the Khalidi family - a very prominent and well connected Jerusalem family. When the subject of building a U.S. Embassy at the site came up in the 1990s, the Khalidi's began a campaign against the construction, based on the fact that the land had been expropriated from them. This fight was, in effect, overtaken by events. After 9/11, it became clear that new security requirements U.S. diplomatic facilities worldwide disqualified the Hebron Road site as location for a future the Embassy. Since then, the Hebron Road site has not been used by the U.S. for any purpose, nor are we aware of any plans in this regard. While many considerations no doubt went into the selection of the site of the Diplomat Hotel for the new U.S. embassy, one of the reasons may be that this site - unlike the Hebron Road site - is not embroiled in that kind of controversy. What is the status of Diplomat Hotel site? The site of the planned new U.S. Embassy is located in an area that was created in southern Jerusalem after the signing of the 1949 Armistice Agreement. This is a large swathe of land around UN Headquarters (Government House), surrounded on all sides by the Green Line (that is, it was an area “between the lines”). By agreement between Israel and Jordan, this area was divided into three zones: the UN Zone (which exists to this day in the area immediately around Government House); an Israeli Zone (to the east of Talpiyot), and a Jordanian Zone (to the north of Sur Bahir). This area has alternately been called “no man’s land,” “a demilitarized zone” and “a civilian zone.” None of these terms is accurate. Both the Jordanians and Israelis maintained a permanent civilian presence in their respective zones between 1949 and 1967 - hence, the area was not “no man’s land.” Parts of the populated areas of Jabel Mukaber were inside the zone, and the Palestinian villagers of the surrounding areas used the lands for agricultural purposes (like the harvesting of olives). In the Israeli zone, the civilian presence in the Israeli area was even more significant. The kibbutzniks of Ramat Rachel were in permanent possession of large orchards, which they tended to and harvested – and it is on these orchards that 20% of the new neighborhood will be built. Likewise, both the Israelis and the Jordanians had a military presence (some of it significant) in their respective zone between 1949 and 1967 - so it is inaccurate to call the area “either demilitarized” or a “civilian” zone. What is the status of buildings that will become the Embassy? About half of the existing consular facility (that will likely become the temporary embassy) is located in the Israeli zone described above; the rest is located inside sovereign Israel. The Diplomat Hotel itself was built in the Israeli zone before the 1967 war. 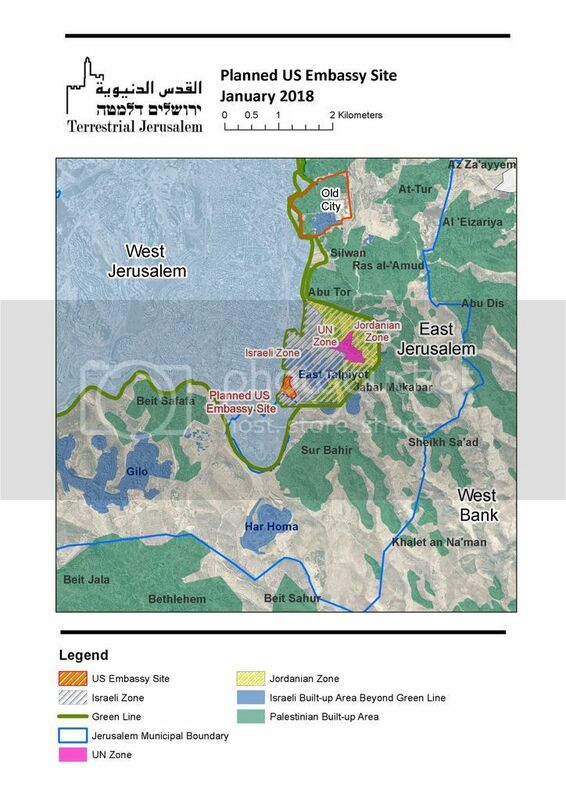 Will the new embassy be located in occupied territory? Despite being located beyond the Green Line, it is a stretch to call the area on which the new U.S. embassy will be located “occupied territory,” given that it was continuously in Israel’s possession between 1949 and 1967 and that it was actively used continuously by Israelis (mostly for civilian purposes, but also for military purposes) – all by agreement with the Jordanians. Indeed, the international community has customarily not treated such areas as occupied. Does this make a difference in terms of the political implications of moving the US Embassy to Jerusalem? Indeed, the Trump Administration’s move to recognize Jerusalem as Israel’s capital has had the effect of increasing focus on the issue, both by the Palestinians (who view Trump’s decision to take Jerusalem “off the table” as inimical to U.S. leadership of any political process) and in the international community, which has been compelled by the Trump Administration’s action to focus on Jerusalem, in order to clarify and re-assert its own position in favor of two capitals in Jerusalem (i.e., the EU’s Foreign Affairs Council report of January 22, 2018, UNGA resolution ES‑10/L.22).